Garlic is from the onion family and closely related to onions, chives, and shallots. It has a strong odor and can be eaten both raw and cooked. Typically spicy when raw, it becomes more mild and sweet when cooked, though overcooking can make it bitter. Garlic is frequently associated with Italian and Chinese cuisines, but is used widely throughout the world. Garlic, smashed with the side of a knife, emits more of its oils than if you chop it or place it whole in a recipe. Large garlic bulbs are "milder" than smaller ones. You can grow it easily in your garden. It does replicate itself. Elephant garlic is much larger and milder, lacking the pungency of ordinary garlic. It should not be used as a direct substitute if the same results are desired. Garlic has a number of healthful benefits. The garlic plant's bulb is the most commonly used part of the plant. With the exception of the single clove types, the bulb is divided into numerous fleshy sections called cloves. Choosing: When buying fresh, purchase firm, plump bulbs with ry skins. Avoid heads with soft or shrivelled cloves, and those stored in the refrigerated section of the produce department. Buying: Fresh garlic is available year round, canned, dried, and powdered, available in any grocery store. Procuring: Garlic is grown globally, but China is by far the largest producer of garlic. Garlic has been used throughout history for both culinary and medicinal purposes. Use chopped or pureed garlic to season anything from salads to soups, from sides to main courses. Used to flavor everything from vegetables, to poultry, beef, lamb, and seafood, as well as dressings, sauces, casseroles, and soups. Cleaning: Break garlic segments away from bulb. Place clove under the side of a large knife and pound once or twice to remove skin. In recipes that call for whole garlic cloves, simply break clovers from bulb, peel, and add to dish. Garlic is stored warm and dry to keep it dormant. It is traditionally hung. Garlic is often kept in oil to produce flavored ol however this practice requires measures to be taken to prevent the garlic from spoiling. Refrigeration does not assure the safety of garlic kept in oil. Peeled cloves may be stored in wine or vinegar in the refrigerator. A popular method for storing in modern day society involves chopped garlic stored in oil. Though the resulting garlic flavor is slightly altered, this serves as a convenient way to always have garlic on hand and ready to use. This involves the removing of the skin of several heads of garlic, chopping the cloves and then the soaking the garlic in a vegetable oil in an airtight glass jar. This keeps for several weeks in the refrigerator. Store fresh garlic in an open container, away from other foods and in a cool, dark place. Properly stored, unbroken bulbs can be kept up to 8 weeks, though they will begin to dry out toward the end of that time. Once broken from the bulb, individual cloves will keep from 8-10 days. Garlic has been regarded as a force for both good and evil. Though it is not mentioned in the Bible, a Christian myth considers that after Satan left the Garden of Eden, garlic arose in his left footprint and onion in the right. In Europe, many cultures have used garlic for protection of white magic, perhaps owing to its reputation as a potent preventative medicine. Central European folk beliefs considered garlic as a powerful ward against demons, werewolves and vampires. History: Garlic has been used a both food and medicine in many cultures for thousands of years, dating at least as far back as the time that the Giza pyramids were built. 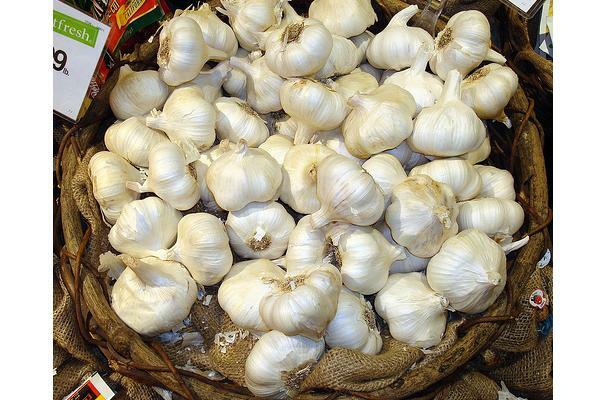 Garlic is still grown in Egypt, but the Syrian variety is the kind most esteemed now. This is our favorite herb ever! Hi mates. I identified this awesome website from bing. I used to be seeking entirely a diverse phrase but google suggested me this site a few instances. I entered to here and examine plenty of issues right here.Later on i determined to register at right here and send my initially message to all mates. I might be glad to find out these great people today at my forums in <a href="http://www.yayinakisi.com">yayin</a>. Thanks for studying my publish and spending your time.